Dr. Oreta Samples, coordinator of Fort Valley State University’s Master of Public Health program, left, and Ann Gillespie, a FVSU veterinary technician, pose with two dogs from FVSU’s kennel, right. 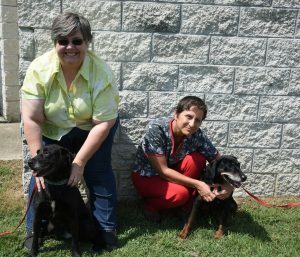 Two Fort Valley State University employees are helping senior canines find new homes and receive proper medical care. Dr. Oreta Samples, coordinator of FVSU’s Master of Public Health program and Ann Gillespie, FVSU veterinary technician, secured a grant of $7,500 from the Gray Muzzle Organization. The Gray Muzzle Organization is a non-profit foundation that helps elderly dogs receive needed medical attention and find new homes or owners. The grant will cover expenses until June 28, 2018. Gillespie and Samples said the funds will be used to cover costs for comfort, treatment and care of elderly dogs that come to the Community Practice for services, or currently reside in the FVSU Department of Veterinary Science and Public Health. The Community Practice is a grant funded clinic within FVSU’s Department of Veterinary Science and Public Health. It operates on a schedule according to the availability of veterinary staff, and animals are treated or seen by appointment only. There, they receive mostly preventive care and heartworm treatment. Funds used from the Gray Muzzle Organization pay for the dogs’ medical bills, taking the financial burden off of people who have senior dogs with medical issues. Gillespie said those factors help the dogs have long, healthy lives and their owners are less likely to abandon them. In addition, Samples said emotional, mental and physical health are key to a person’s well-being, especially seniors. Samples said typically seniors with animals have normal blood pressure levels and healthy hearts because they have animals to share their life with. The public health professor said this grant helps seniors because as they get older, their income may decrease. For this reason, seniors often face the dilemma of choosing between spending their income on living expenses or health costs of their dog. “We felt that this would be a good way to encourage seniors and make sure their animals get the proper care as far as senior animals are concerned,” Samples said. The grant will also have an impact on FVSU’s Veterinary Technology program, particularly its senior canine population. Gillespie said students working at the clinic on campus receive hands-on experience. She also said students gain experience by caring and treating older animals with specific ailments such as hearing loss and blindness. For more information about the Gray Muzzle Organization grant, contact Gillespie at (478) 825-6424 (gilliespiea@fvsu.edu) or Samples at (478) 825-6904 (sampleso@fvsu.edu).